As Dogecoin climbs up from an incredibly long 30 satoshi run to 100 satoshi, the community has done their best to remind themselves of their place in the world. While they want to be taken seriously in the financial aspect, they also want to hold onto that goofy demeanor that got them famous in the first place. Bitcoin may be number one across the board, but Dogecoin remains number two on CoinGecko and number five on Coinmarketcap despite all the bickering between the two communities. What’s the best way to describe their relationship? Through a goofy GIF, of course. 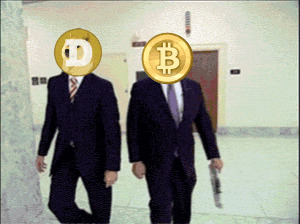 This GIF is, arguably, the first to perfectly explain the Dogecoin relationship with Bitcoin. While Bitcoin is looking for Amazon to start accepting it, Dogecoin is dancing behind and thinks good things will come eventually. And they did; the GoCoin CEO confirmed PayPal will utilize Dogecoinduring integration. In the early days, Dogecoin caught a lot of flack from the Bitcoin community. In a way, the very idea of Dogecoin made a mockery of the serious principles behind Bitcoin. As the so-called “shibes” heard Bitcoin users rattle off insult after insult, the shibes retaliated quietly; silently upvoting Dogecoin-related posts on the Bitcoin subreddit. This GIF does that conversation some justice. As mentioned above, Bitcoin enthusiasts were visceral to the Dogecoin community. Insults were thrown left and right; the Bitcoin community started to implode on itself in regards to the topic. Now when a Bitcoin user lobs a nasty statement about shibes, they’re silenced by others who stand-up for the goofy kid at school. At the end of it all though, both Bitcoin and Dogecoin can be used for purchasing products. No matter how much they bicker, they’re inevitably turning people to cryptocurrency because of the benefits. Let’s be honest, putting your credit card information on every single website you purchase from is a hassle, and cryptocurrency is the easiest way to pay by far.